Thank you for your interest in the Zoo Technology(zookeeping) program at Jefferson Community College - State University of New York! Choosing a degree program and a profession is a big decision! 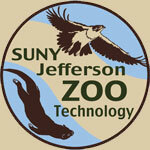 This survey is designed to help you know what to expect if applying to SUNY Jefferson's zoo program and pursuing a career as a zookeeper. There are 25 optional questions and detailed information about the Program; skip over any questions that do not apply.